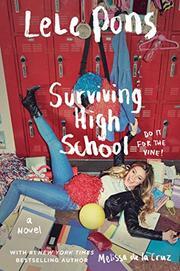 Vine star Pons crafts a high school novel with herself as protagonist. Lele Pons is your typical social media star: pretty, quirky, insecure, and sensitive. She stumbles her way through high school by day and carves out an Internet presence for herself by night. When her parents transfer her from a small Catholic school to a large Miami public school, conspicuously blonde Latina Lele makes the best of things, acquiring a black friend, a mean-white-girl enemy, and a pretty-white-boy crush. Lele does her best to balance her school life with her escalating Internet fandom, one that explodes over the course of the school year. Pons and co-author de la Cruz craft an unremarkable narrative; the characters are all fairly one-note, and nothing really dramatic ever happens. Crushes blossom and wither while friendships deepen, but a new spoke is never added to that tired wheel. Pons uses the quick wit developed by her Vines to move things forward at a remarkable pace, constantly sprinkling in silly asides—as well as hashtags, Webspeak, and references to her Rapunzel-like hair. She puts an inordinate emphasis on the value of physical attractiveness, financial gain, and fame. Lele wants to be a famous actress, emphasis on famous, with little interest in theater or the acting craft, which may play well to her fans but will alienate her fellow aspiring thespians.